SYSTEM.DATE_THRESHOLD* : Represents the database date requery threshold. 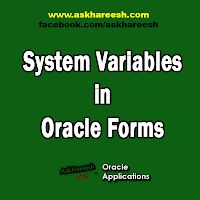 This variable works in conjunction with the three system variables $$DBDATE$$, $$DBDATETIME$$, and $$DBTIME$$, and controls how often Oracle Forms synchronizes the database date with the RDBMS. The value of this variable must be specified in the following format: MI:SS . Because frequent RDBMS queries can degrade performance, it is best to keep this value reasonably high. However, keep in mind that if the value is not synchronized often enough, some time discrepancy can occur. In addition, if you are building a client-server application, the performance implications ofSYSTEM.DATE_THRESHOLD could vary depending on the complexity of your network configuration. • CHANGED - Indicates that the form contains at least one block with a Changed record. The value ofSYSTEM.FORM_STATUS becomes CHANGED only after at least one record in the form has been changed and the associated navigation unit has also changed. • NEW - Indicates that the form contains only New records. • QUERY - Indicates that a query is open. The form contains at least one block with QUERY records and no blocks with CHANGED records. SYSTEM.LAST_FORM : Represents the form module ID of the previous form in a multi-form application, where multiple forms have been invoked using OPEN_FORM. The value can be one of two character strings: either the form module ID or NULL. SYSTEM.LAST_QUERY : Represents the query SELECT statement that Oracle Forms most recently used to populate a block during the current Run form session. The value is always a character string. • TRUE - Indicates that the current record is the last record in the current block's list of records. • FALSE - Indicates that the current record is not the last record in the current block's list of records. SYSTEM.MASTER_BLOCK : This system variable works with its companion SYSTEM.COORDINATION_OPERATION to help an On-Clear-Details trigger determine what type of coordination-causing operation fired the trigger, and on which master block of a master-detail relation. The values of the two system variables remain constant throughout the clearing phase of any block synchronization. SYSTEM.MASTER_BLOCK represents the name of the driving master block, and SYSTEM.COORDINATION_OPERATION represents the coordination-causing event that occurred on the master block. More details are in the description for SYSTEM.COORDINATION_OPERATION. SYSTEM.MESSAGE_LEVEL* : Represents one of the following message severity levels: 0, 5, 10, 15, 20, or 25. The value is always a character string. During a Runform session, Oracle Forms suppresses all messages with a severity level that is the same or lower (less severe) than the indicated severity level. The legal values for SYSTEM.MESSAGE_LEVEL are 0, 5, 10, 15, 20, and 25. Oracle Forms does not suppress prompts or vital error messages, no matter what severity level you select. SYSTEM.MODE : SYSTEM.MODE indicates whether the form is in Normal, Enter Query, or Fetch Processing mode. The value is always a character string. • NORMAL - Indicates that the form is currently in normal processing mode. • ENTER-QUERY - Indicates that the form is currently in Enter Query mode. • QUERY - Indicates that the form is currently in fetch processing mode, meaning that a query is currently being processed. SYSTEM.MOUSE_BUTTON_PRESSED : Indicates the number of the button that was clicked. Mouse button support is limited to buttons 1 and 2 (left or middle) on a three button mouse. The value is always a character string.